This orchid is the most commonly found of the Coralroot Orchids that occur in the Pacific Northwest of America. 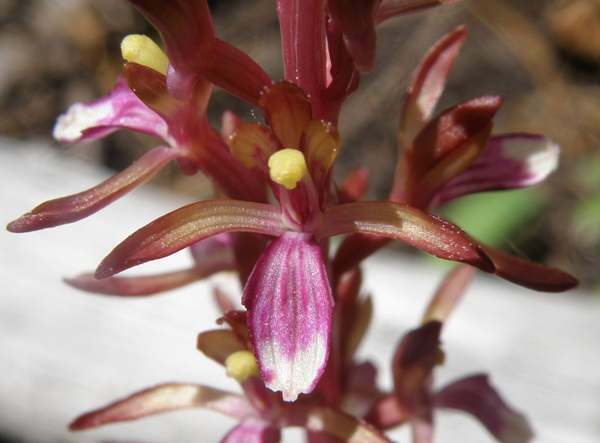 It shares territory with the only species of Coralroot Orchid that is found in Europe, namely Corallorhiza trifida. In America the latter is known as Early Coralroot Orchid, while in Europe it is known simply as Coralroot Orchid due to its sole representation of the genus there. This colourful plant grows up to 60cm in height and has up to 40 dark red-to-purple flowers in its tall inflorescence. The name coralroot refers to the roots of the orchid plants, which are said to resemble coral - although digging up a plant to confirm its identification is, of course, strictly illegal and so we have never seen this underground feature. 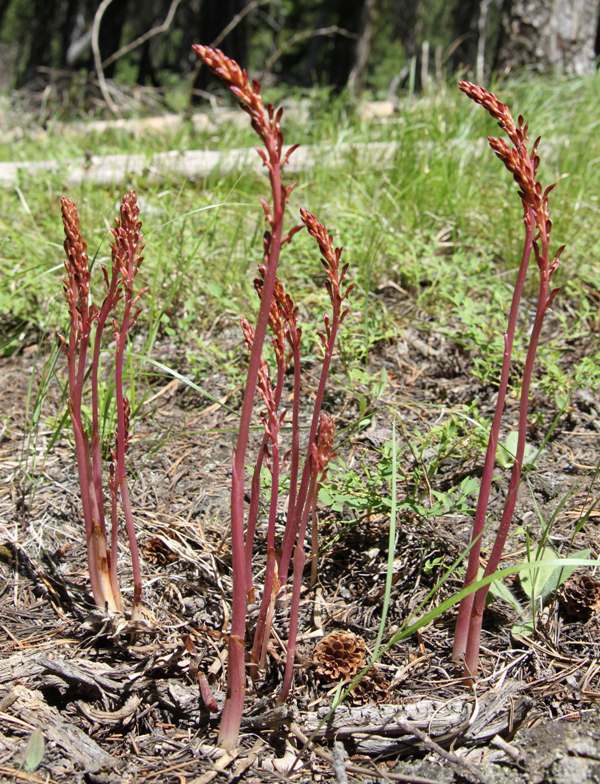 Western Coralroot Orchid occurs from the Pacific Northwest to northwestern California and through most of British Columbia; it also grows in Idaho, Wyoming and Montana. This attractive orchid occurs mainly in dark or partially shaded coniferous and broadleaved forests. Although it produces some chlorophyl (hence some plants are greenish, although many are purple-brown), this orchid is largely saprophytic, depending mainly for its food on the mycorrhizal fungi surrounding its roots. Coralroot orchids are capable of self-pollination. In America Corallorhiza mertensiana is distributed from southern Alaska south to California, and east to Montana and western Wyoming. Western Spotted Coralroot Orchid flowers in June and July. A close-up of the delicately coloured flowers of Corallorhiza mertensiana. Philip E Keenan (1998) Wild Orchids Across North America, Timber Press Inc.